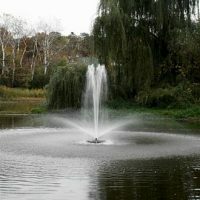 While Lake and Pond aerating fountains offer an aesthetic touch, they also add an extreme amount of functionality. 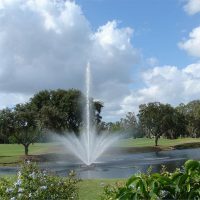 Maintaining the health of your pond or lake is essential, and the aeration and circulation provided by a fountain can help in the process. 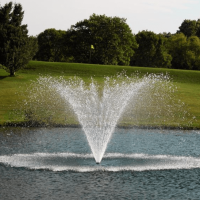 Here at ProPond & Lakes, a leading fountain aeration provider, we offer top of the line brands including AquaControl, Kasco and Otterbine fountains. Aside from our selection of products, we pride ourselves on offering complete customer satisfaction, and we are always available by phone for any questions or estimate requests you may have. Having a high-quality and properly sized aeration system is essential for a balanced aquatic ecosystem. Natural occurrences or even simply, stormwater can throw off your ecosystem and add excessive nutrients to your water. By having a fountain aerator in place, you’ll be able to mitigate the damage and reduce water quality issues. 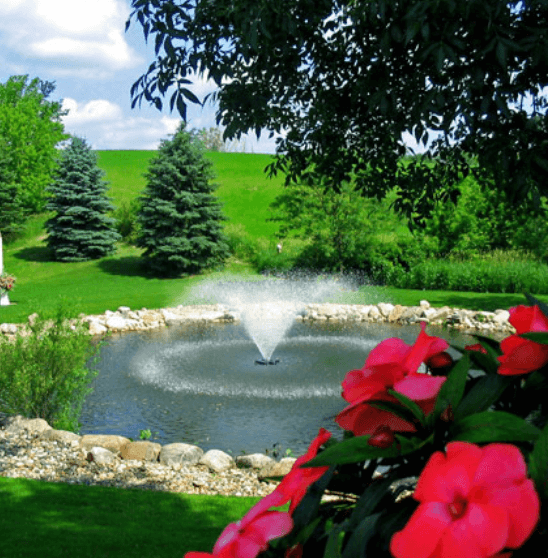 Your pond or lake environment will be greatly improved upon adding a fountain aerators. Aerators help remove phosphorus from the water, thus greatly reducing the growth of algae. Your system may also move algae spores to deeper parts of your lake or pond, providing less sunlight and time for the algae to spread. Organic matter decomposes much more slowly under low oxygen conditions, and this leads to a buildup of bottom sediment in your waterbody. Proper aeration will help to reduce the overall accumulation of organic sediment on the bottom of your lake or pond, potentially prolonging or preventing the need for future dredging. Having an aerator in your pond or lake helps to promote an oxygen-rich aquatic environment which offers a healthier habitat for fish and aquatic life. The continuous circulation of water provided by an aerator also helps to reduce mosquito activity. As providers of pond and lake management supplies, we want to offer you a large selection of lake and pond aerating fountains. Compared to most 3/4 HP and 1 HP fountains, The Airmax Ecoseries Floating Fountain stands out with an exquisite spray pattern. Designed for easy assembly, no tools will be required in the installation of an AirMax fountain. This series also boasts an energy-efficient tag, providing 5.8 Amps and 696 Watts on 120V power. Here at ProPond & Lake, we offer the Evolution Series in the AquaControl line. For lakes or ponds with up to 16,000 gallons this series combines beauty and function. 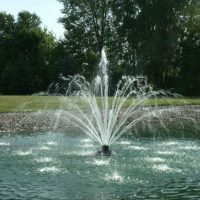 This economical but powerful aerator fountain can aerate up to 1/2 acre, and offers low operating costs. Aquamaster Decorative Series: This series features a beautiful eight display, offering aesthetics for both natural or urban aquatic areas. Aquamaster Master Series: A step up from the decorative series, the Master series offers the ability to change spray patterns for an interesting waterscape, while also improving water quality. Aquamaster Celestial Fountains: The most complete Aquamaster series is the Celestial fountains. Boasting 10 spray patterns, the waterscape trajectory and aesthetic is out of this world with eight displays present. 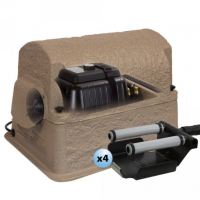 Kasco Marine J Series: From 3/4 HP to 7.5HP, the Kasco J Series can fit in any pond or lake. Built with corrosion and clog resistant technology, this is a reliable, sustainable fountain that offers elegant spray patterns. 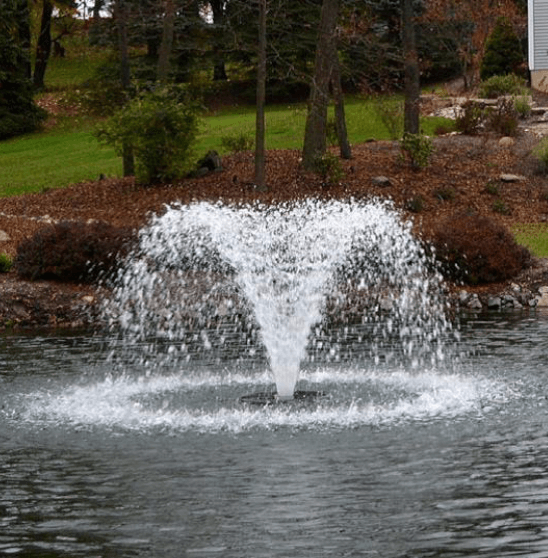 Kasco Marine VFX Fountains: Stemming from the product name, the Marine VFX Fountain has a V-shaped circular display pattern, while also setting the standard for outstanding oxygenation, without sacrificing design or beauty. 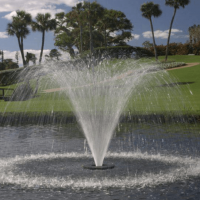 Kasco Marine XStream Fountain: Find quick and easy customization in the Kasco Marine XStream Fountain, perfect for any small pond or decorative application. This is an inexpensive fountain option that is easy-to-install and still has the classic “V” shape as other Kasco lines. Otterbine 5-in-1: There’s everything you could need in an aerating fountain for the Otterbine 5-in-1 and more. Within 10 minutes you can change within 4 different fountain spray patterns or convert to a horizontal mixer. Operating in as small as a 16 in or 41 cm pond, the 5-1-in consumes less energy and a significant savings cost. Otterbine Aerating Fountains: We offer 11 of the most popular Otterbine Aerating Fountains, engineered for outstanding aeration and attractive displays. With as little as 30 in. 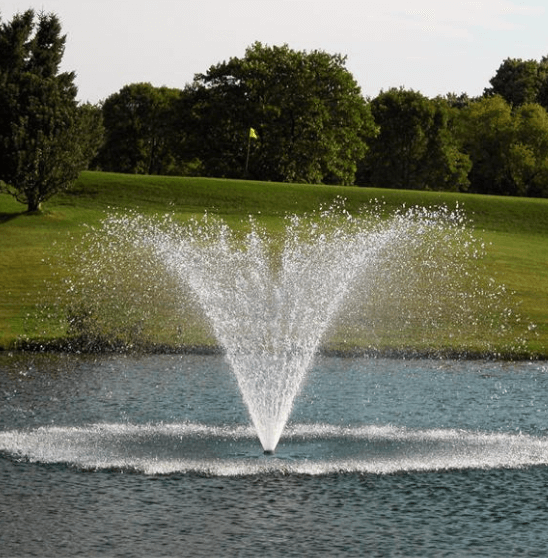 of water, any of the Otterbine Aerating Fountains are perfect for your pond or lake. 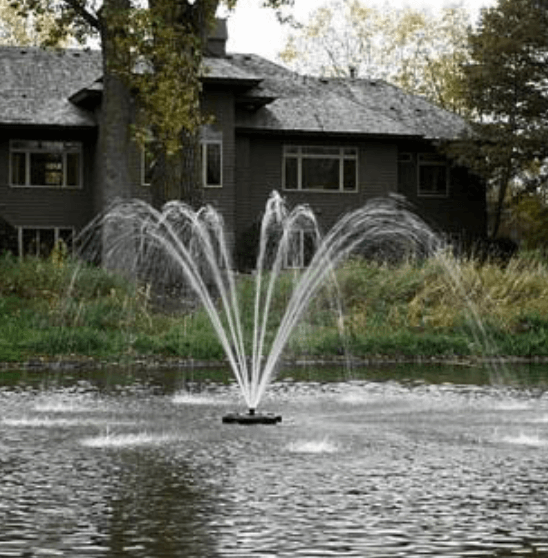 When it comes to the aesthetics and oxygenation of your pond or lake, aerating fountains are one of a kind. While serving as a piece of decoration, aerating fountains are engineered to help sustain the clarity and health of your pond or lake.